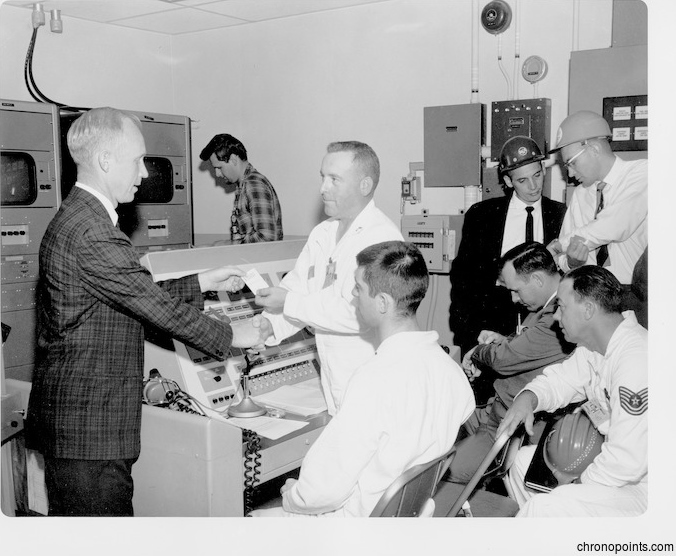 Dr. Cal Fowler (1929-2013) and other unidentified workers at the Strategic Air Command (SAC), during the period that it was located at Francis E. Warren Air Force Base near Cheyenne, Wyoming. 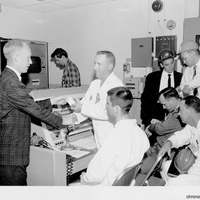 Dr. Fowler later transferred back to Cape Canaveral Air Force Station (CCAFS) in Cape Canaveral, Florida, and launched three of America's Mercury 7 astronauts into orbit in Mercury-Atlas missions. Original black and white photographic print: Private Collection of Dr. Calvin D. Fowler. Digital reproduction of original black and white photographic print. Originally owned by Dr. Calvin D. Fowler. Copyright to this resource is held by Dr. Calvin D. Fowler and is provided here by RICHES of Central Florida for educational purposes only. Hopkins, J. C., and Sheldon A. Goldberg. The Development of Strategic Air Command, 1946-1986 (the Fortieth Anniversary History). Offutt Air Force Base, Neb: Office of the Historian, Headquarters Strategic Air Command, 1986. “Dr. Cal Fowler Strategic Air Command.” RICHES of Central Florida accessed April 20, 2019, https://richesmi.cah.ucf.edu/omeka/items/show/6406.